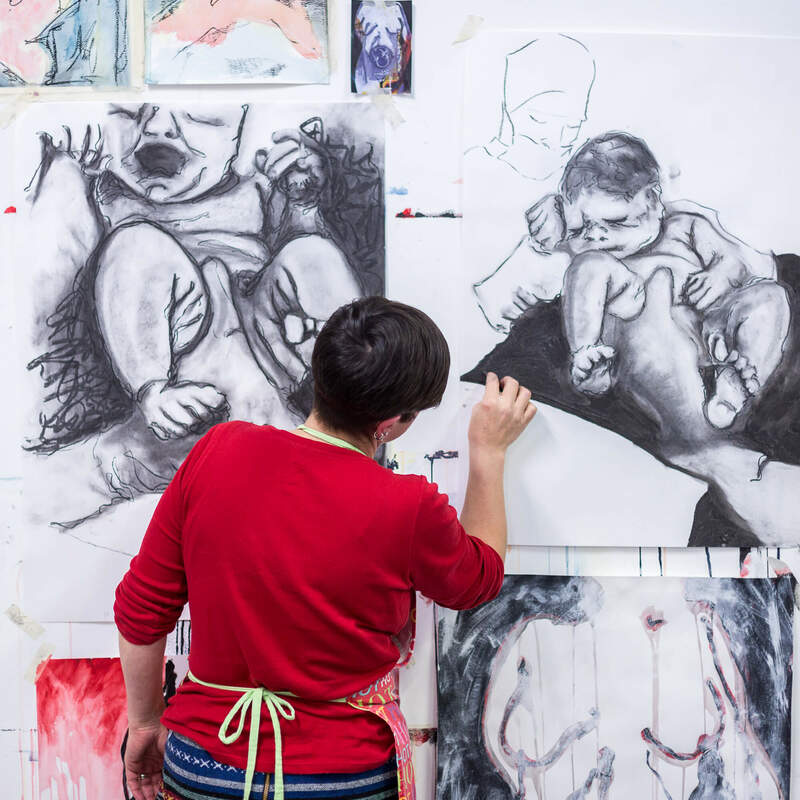 Discover your artistic potential on a course at the forefront of contemporary practice. We give you time, space and encouragement to explore, experiment and emerge as a confident practising artist. Discover your artistic potential on a course at the forefront of contemporary practice. Join us to work with leading artists and educators in developing your creativity through experimentation with media and materials to emerge as a confident practising artist. You will develop your personal creative voice in our outstanding modern studios, working within and across a wide range of artistic disciplines. Our tutors are highly respected and internationally renowned artists, researchers and educators who will inspire and enthuse you. We will equip you with the professional skills to fulfil your ambitions as a practising artist or to pursue careers in fields ranging from community arts to curation. 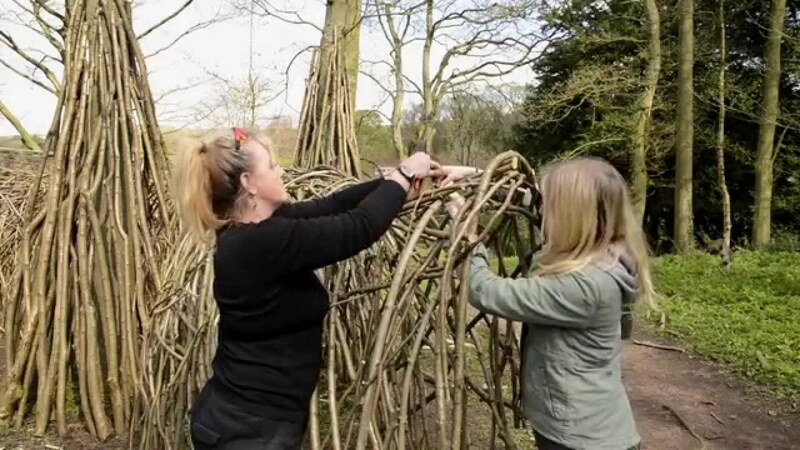 Watch our students create interactive sculptures in Ilam park near Ashbourne. All students engage in creating conceptually challenging art that pushes the boundaries of personal expression. What makes our programme unique is the emphasis we place on ‘making’ skills in developing a studio practice regardless of the discipline engaged in. A key strength of the programme is having an intake of 30 students per year in order to ensure we have a close-knit community of art students that can be fully supported. It is because of this close support that we have excellent retention, high numbers of good degrees, and positive student feedback. We feature in the top 15 in the 2016 Guardian subject league tables for art and have achieved over 90% satisfaction for 4 consecutive years. This is based on criteria such as students’ satisfaction with course content, teaching and feedback as well as the employment track record of our graduates. Our graduates are in work or further study within six months of completing this course (HESA 2016). A significant part of this course is spent in our modern studios where you explore personal themes and experiment with different working methods, materials and processes. We provide you with your own dedicated and permanent studio space from which you will work throughout your time on the course. The wide-ranging facilities on offer encourage you to explore a variety of paths in your artistic practice – everything from painting, printmaking, photography, sculpture and installation to sound, film and video, digital media and performance. You have access to resources such as our industry standard Apple Mac suite, a large printmaking studio, darkrooms, music studios, and workshops for large-scale projects involving plaster, ceramics, wood and metal. We offer an outstanding specialist Art and Design Library, a bureau for professional fine art printing, and a digital media equipment centre from which you can borrow industry-level video, film and photography equipment. 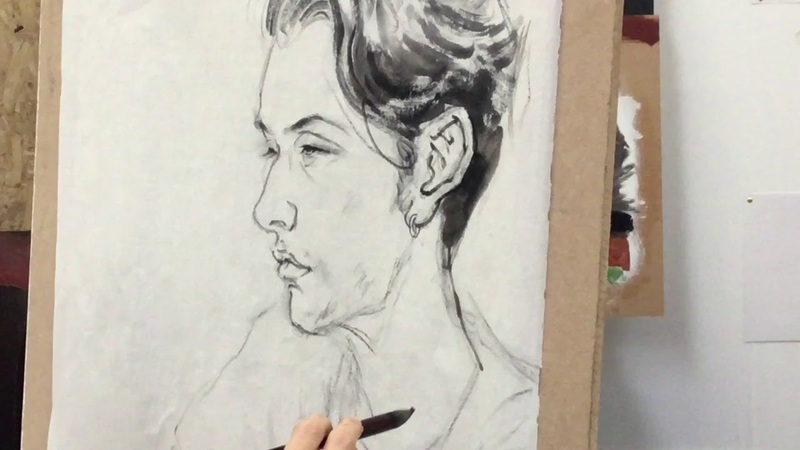 Visiting Professor Yan Wang gives a demonstration of Chinese portrait painting with BA Fine Art student Richard as a model. The Fine Art Studios are a bustling creative environment. Each of us is given a space directly appropriate for our artistic needs. There are also workshops in everything from analogue photography to casting in bronze. At this stage, you will learn more about the ethos and philosophy of fine art practice, especially allied to studio work. There is a greater emphasis on experimentation and work that helps you develop your individual personal voice. At this stage, the focus is on a substantial amount of independent study. You learn through studio workshops, group and individual tutorials, seminars and lectures. These are supported by a vibrant and diverse programme of visiting artists who will update you on latest developments within the cultural industries. Each year of the course, you will have the chance to visit a cultural centre in Europe or the USA, as well as national galleries and museums. You could also undertake site-specific projects, including residentials, in the nearby Derbyshire Peak District. Throughout the course, there is ample opportunity to exhibit your work or take part in prestigious competitions. Our students are regularly offered artist residencies at home and abroad and have gained coveted places at events such as the Students’ International Biennale. The culmination of your degree will be a major public exhibition where you can showcase your work to influential figures from the art world, prospective employers and the wider public. You will be assessed on your studio work through exhibitions, formal presentations of developmental and resolved work, and your contributions to individual tutorials, group critiques and seminars. There will be some assignments and essay work to submit for your theoretical studies. As a Fine Art student, you will have a permanent base within the recently refurbished Fine Art studios at the historic Britannia Mill site. We will nurture your artistic and creative independence, ensuring that you graduate as a self-motivated, resourceful and versatile fine art practitioner. Many of our students go on to become long-term practising artists – undertaking residencies, opening studios, exhibiting nationally and internationally, and lecturing. The skills you develop will be valuable across the creative economy so – apart from furthering your development as a practising artist – you could progress to careers in areas such as curatorship, art therapy, community arts or teaching. If you would like to set up your own creative business, look no further than our incubation unit – Banks Mill – which offers studio workspace and business development activities. You’ll become part of a vibrant and thriving community of artists, designers and makers. 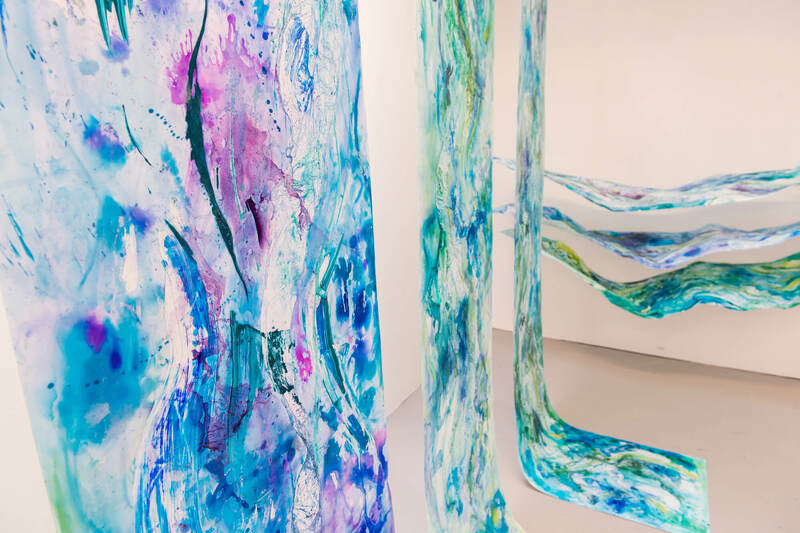 Our graduates also regularly choose to advance their knowledge on Masters programmes nationally and internationally, including the MA Fine Art at Derby. Fine Artist Paul Cummins is a University of Derby graduate who has gone on to curate one of the most memorable WWI exhibitions, Blood Swept Lands and Seas of Red.